Of 33 Shalhevet drivers polled in March, over a third had already been in accidents. Too young to accurately perceive the dangers, Shalhevet students are doing their share of texting, speeding and eating while driving. Before anything else, the first fact a student seeking his driver’s license learns is that teenagers are three to four times more likely to get into a car accident than adults–this is stressed since traffic accidents are the leading cause of death among teenagers nationwide. Studies have shown that the reason is teenagers’ general lack of responsibility and of driving experience. Shalhevet students are no exception. A recent Boiling Point poll of students with licenses found that most Shalhevet drivers regularly break several laws while driving, and 42 percent have already been in an accident — despite having been licensed for, at most, just two-and-a-half years. “It is just a major thrill when you feel your engine working harder and harder,” said senior Yosef Nemanpour, a thoughtful student who is admired for his individuality and commitment to Torah. It was just a minor fender-bender, but soon after receiving his license, Yosef hit his dad’s car when backing up. Of 33 drivers polled, over a third had already been in accidents. A total of 33 sophomores, juniors and seniors completed the anonymous survey March 27 during lunch. Twenty-five of them had their own car. Their answers explain why so many have had either car accidents or traffic violations. The most common driving violation reported is one of the most dangerous: texting. Sophomore Elon Glouberman said that many teens text on their phones while driving because they’re addicted to technology. Slightly over one half of students admitted to having texted while driving at least once. Sixty-four percent of them admitted to having talked on the phone. The use of hand-held technology while driving is strictly forbidden under California law and would result in fines of $160 for texting and $76 for talking on the phone, and those fines are just for a first offense. Motorists under the age of 18 are not even permitted to use hands-free technology, like Bluetooth or other earpieces, let alone hand-held devices. This rule was established to avoid teenagers being too distracted from fully concentrating on the road, but according to Driversedguru, 47 percent of teenagers nationally have texted while driving and over half have spoken on the phone. Such distraction is said to be another reason why adolescents are much more dangerous drivers than adults, as studies have calculated that a person is 23 times more likely to be involved in an accident if they are text messaging. Driving under the influence is another problem from which students are not immune. Sophomore Daniella Banafsheha said people may feel that they need to drive home themselves to avoid getting in trouble, underestimating the risk they are taking. “They do it because they fear their parents finding out that they were drinking,” Daniella said – even if their parents have told them to call or get a ride in such a case. Perhaps all these reasons can be explained by teen psychology. Science has found that the prefrontal cortex, which is the part of the brain responsible for judgments, impulses and emotions, is not fully developed in teens, thus making them more dangerous drivers. In other words, even if they understand something’s dangerous, they either can’t control their behavior or don’t really believe a bad accident could happen to them. 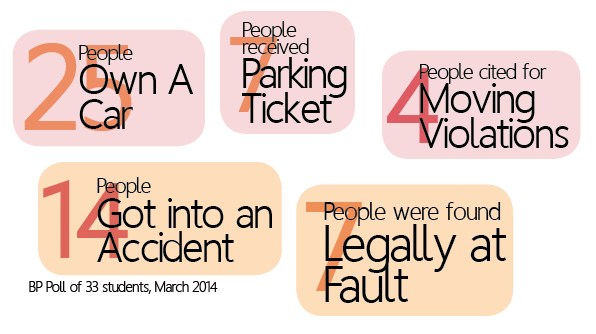 Precisely one third of the questionnaire participants have received a ticket for either a parking or moving violation, such as speeding, running a red light, not stopping at a stop sign, or parking in a prohibited section. These numbers are still considerably lower than average. Abel’s Driving School’s website says that nationally, nearly half of drivers who start driving before they are 20 years old are convicted of a traffic violation within their first year of driving. According to Statistic Brain, an online information bank, California has the fourth most driving citations in the country. Teenagers, due to their frequent driving mistakes, are easy targets for tickets. On March 25, sophomore Jacob Dauer was pulled over for passing over a stop sign, just a couple months after acquiring his license. Fifteen percent of the students who participated in the poll have driven under the influence of either alcohol or other substances, presumably after a Saturday night party from which they had to return home. There are an estimated eight fatalities a day as a result of a teenager driving under the influence, according to courtinfo.gov. Another study, conducted by SADD — Students Against Destructive Decisions, an organization aimed at preventing teenage car accidents — concluded that one in every four teens has been drunk while driving, but the author of that survey added that many of them did not believe driving under the influence actually affects their safety and driving capabilities. “Forty percent of teenagers who say they have driven while under the influence of alcohol claim that alcohol either improved their driving or made no difference,” Medical News Today said, reporting that study. But according to CDC.gov, even a small blood alcohol concentration level can alter a person’s sense of judgment, reasoning, coordination and other essential attributes needed to safely drive. Another common driving infraction among teens is speeding. Forty-five percent of Shalhevet drivers have driven at least 20 miles per hour over the speed limit, which even without an accident would have resulted in a fine of $150. Speeding is what leads to over half of teenage car accidents nationwide, and 38 percent of fatal accidents among drivers aged 16 to 19 are a result of speeding, according to the Governors Highway Safety Association. Finally, the bad driving habit most Shalhevet students admitted to was eating a meal while driving. Almost two-thirds — about 60 percent – have eaten behind the wheel. And even taking a bite of lunch can serve as a major distraction for students who are still beginners. Although the numbers are not as significant when compared to teenagers across the United States, these illegal driving habits are still prevalent among Shalhevet student drivers. Fortunately, none of these dangerous tendencies has translated into a major accident in the Shalhevet community. Although 14 people have gotten into accidents, in which 57 percent of them were at fault, none of the accidents led to any injury for either of the drivers or passengers. It did lead one student, however, to pay $600 for repairs. That student did not want reveal his/her name on the poll sheet. Among those who have been in an accident, only five said they would try to be more careful in the future. In fact, although some people may have been a bit scared to drive the next time around, most were not even slightly affected by the accident and said that they continued driving the same way they had been before, whether or not they were reckless in the past. Attaining a drivers license in California involves a few steps. First, the student must enroll in a driving course, either online or at the DMV, in order to learn the basic rules of the road. Once they reach the age of 15-and-a-half, they are permitted to take a written test based on the course material. After passing the written test, teenagers are legally allowed to drive in a car accompanied by an adult 25 years or older. Six months into having their permit, they may take the driving road test, and if they pass that, they can drive by themselves. “I know for a fact that what I felt about my driving skills at 16 was inaccurate,” said General Studies Principal Mr. Roy Danovitch. “So much of driving is about experience. I don’t know what the best year to drive is because at some point you have to go on the road, but it really all depends on the rigor of the driving test. Meanwhile, there is a huge loophole in the system that teens can, and some do, exploit. Rather than actually studying from the online course in order to pass the permit exam, some just study from older DMV tests. Since there are only six different exams, it is extremely easy to merely skim the questions on those exams and then know which questions will be on their test. As a result of this shortcut, students tend to not know all the rules about driving despite being legally approved to get their hands on the wheel. California has long debated whether or not 16 is an appropriate age to license drivers. Ultimately, the state decided to postpone the age of when teenagers can attain their license by two more years for people born after the year 2000. That means that in the year 2016, there will be no 16-year-old licensed drivers in California, with a few exceptions to that rule. Legislators approving the bill said they hoped it would reduce the number of teenage driving casualties, which currently stands at 5,000 deaths per year. But some Shalhevet students do not think it’s such a great idea. Perhaps they’ll just have to stay home and study for their driving test. Alternatively, they could spend some time reading the statistics.